In "Unbreakable Runner," CrossFit Endurance founder Brian MacKenzie and journalist T.J. Murphy examine long-held beliefs about how to train, tearing down those traditions to reveal new principles for a lifetime of healthy, powerful running. "Unbreakable Runner" challenges conventional training tenets such as high mileage and high-carb diets to show how reduced mileage and high-intensity training can make runners stronger, more durable athletes and prepare them for races of any distance. CrossFitters who want to conquer a marathon, half-marathon, or ultramarathon will find endurance training instruction with 8- to 12-week programs that combine CrossFit workouts with run-specific sessions. 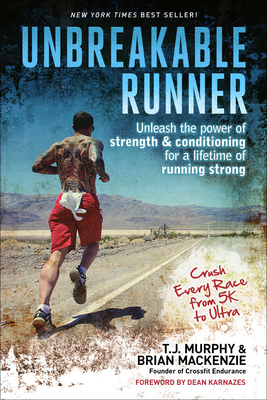 "Unbreakable Runner" includes CrossFit-based training programs for race distances from 5K to ultramarathon for beginner, intermediate, and advanced runners. Build a better running body with this CrossFit Endurance-based approach to running training. Brian MacKenzie is a strength and conditioning coach and the creator of CrossFit Endurance. MacKenzie has been featured in "Competitor," "Runner s World," "Triathlete," "Men's Journal," "ESPN Rise," "The Economist," "Outside," and Tim Ferriss' bestseller "The 4-Hour Body." He has consulted with several teams, including the 2012 Western Athletic Conference Champions San Jose State Women's Swim Team. T.J. Murphy is a writer, veteran endurance athlete, and CrossFitter and the former editorial director of "Triathlete," "Inside Triathlon," and "Competitor "magazines. His work has also appeared in "Runner s World" and "Outside "magazines."